Roland has reinvented and relaunched its Blues Cube combos with a series featuring Roland’s exclusive Tube Logic design that carefully emulates the preamp and poweramp tube responses of classic tube amps. 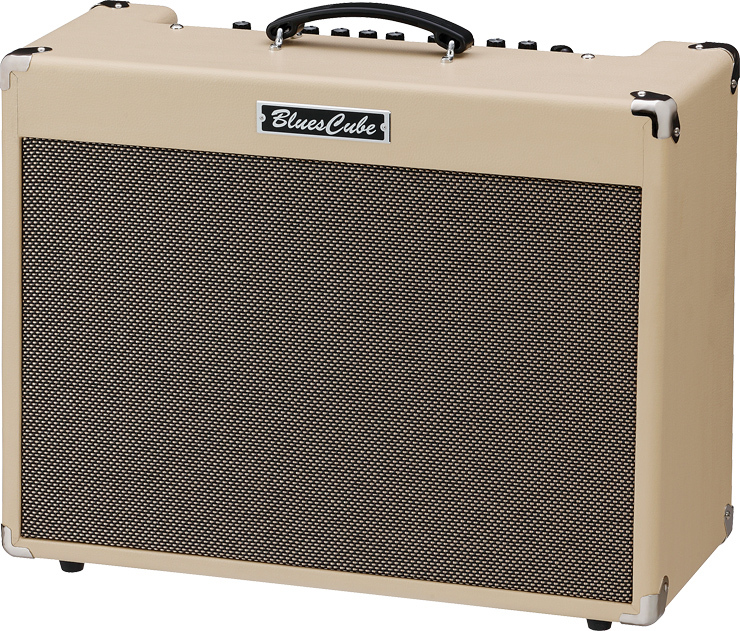 One of these, the Blues Cube Artist, features a classic old-school appearance – cream-colored tolex, basket-weave grille cloth, chrome hardware, and top-mounted control panel. Housed inside the lightweight (total weight 35 pounds) cabinet is a single custom-tuned V12 80-watt 12″ driver. Control layout includes Channel Select and Dual Tone switches; Clean channel with Volume knob and Boost and Tone switches; Crunch channel with Volume and Gain knobs and Boost and Tone switches; a shared Equalizer section with Bass, Middle, and Treble tone controls; an Effects section with Tremolo depth and Tap tempo controls, and Reverb depth control; global Presence control and global Master volume; and a chickenhead Power Control. An array of connections include High and Low inputs, in/out effects loop jacks, a headphone jack, Line Out jack, a trio of jacks for optional footswitches, and a USB jack for direct recording to a computer. We checked out the Blues Cube Artist with a Fender Custom Shop 1960 Reissue Strat loaded with a trio of Custom Shop single-coils and a PRS SC 245 with 57/08 humbuckers. The Clean channel exhibited a very crisp, slightly scooped-out Fender-ish sound with tons of head room and tube-like overtones. The Tone switch for the Clean channel worked much like a typical Bright switch, adding clarity to the PRS’s humbuckers. The Crunch channel’s tone was surprisingly thick with a very tweed-like overdrive/distortion. Like a tube amp, the front end cleaned up nicely by simply rolling back the volume on the guitar or by laying off the pick attack. The Dual Tone channel switch, which engages both channels at once, allowed simultaneous clean and overdrive sounds with very fat results. As we dialed back the output power via the Power control we not only decreased the amp’s overall volume but got a bit of tube-like “sag” or compression, adding to the vintage response and sound. The onboard digital reverb circuit had a clean tone and retained the warmth of a genuine spring reverb without sounding too digital. The tremolo circuit features a backlit tempo switch that pulses to tremolo speed. The tremolo itself proved not too choppy and did not kill the amp’s overall volume. While the Roland Blues Cube Artist definitely fulfills its namesake with great blues tone, its clean and crunch channels and quality onboard effects make it a great choice for a variety of styles. This article originally appeared in VG February 2015 issue. All copyrights are by the author and Vintage Guitar magazine. Unauthorized replication or use is strictly prohibited.